Tea is different all around the world. The plant is the same, of course: all tea comes from the leaves of the Camellia sinensis plant, but the method of preparation and the equipment used varies by quite a bit. The strong black tea with milk that the English drink is incredibly different from the sweet iced tea of the southern United States or the delicate green tea that’s enjoyed in Japan. This means that you’ve got quite a lot of room for expressing yourself when it comes to making tea. 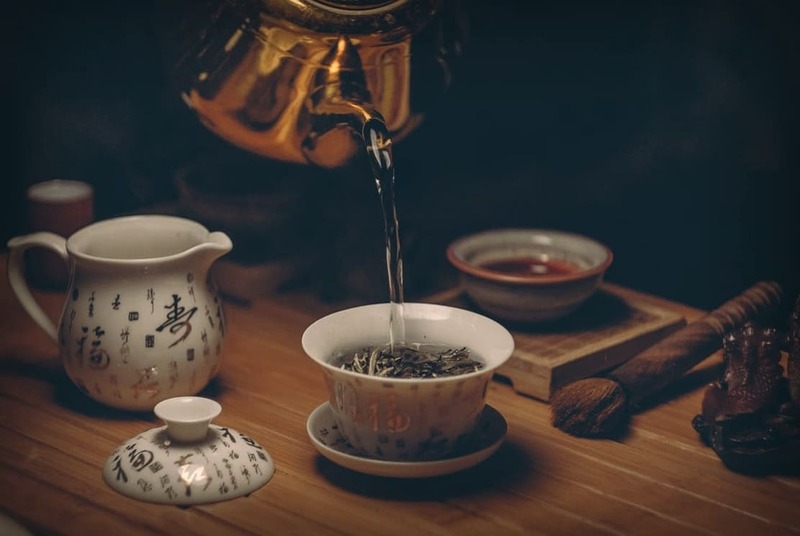 One option involves fully embracing a traditional tea ceremony and preparing tea in an ornate, ritualized fashion, Alternately, you can simply borrow the ideas you like and prepare your tea in a more casual and efficient way that suits your tastes and style. 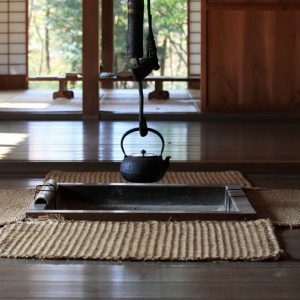 Whether your style involves a cast iron teapot or you want to fully perform a Nanbu Tetsubin tea ceremony, these four Japanese tea kettles are some of the best options available. I’ve tried to cover a wide range of styles with my selection so that you can choose the kettle that best suits your tastes and kitchen. This teapot represents the best option for most tea enthusiasts. Handmade and absolutely beautiful. If you’re serious about Japanese tea kettles, this handmade product is one of the best options available. If you want something that’s a bit more affordable but still stylish, this teapot has you covered. If you’re looking for a flashier kettle with all of the traditional features of a tetsubin, this one is definitely a great choice. With over 100 years of experience making cast iron teapots, Iwachu is a venerable brand that brings quite a lot to the table. Each pot is made with a blend of hand-crafted care and just a pinch of modern technology to speed things along and ensure a consistent, quality product. They take things slow when they make teapots: not only is each teapot manufactured using a 62+ step process, in order to become master craftsmen, Iwachu artisans train for over 30 years. So what does this mean for your teapot? For one, it’s going to be just a little bit unique. It’ll also be extremely high quality since an actual person has gone over every little detail to make sure things are just right. This is one of the most important things you should look for in your tetsubin. While you can get a cheap machine-manufactured tetsubin that will hold water just fine, it’ll often have chips, cracks, peeling enamel, or other defects. When you pour boiling water through these defects day after day, you’ll often get bad tasting tea. It also means you get an authentic Japanese-style teapot. This isn’t some flashy tourist trap that’s designed to look “Japanese.” Instead, it’s a subdued (but still beautiful) design that showcases incredible artisan work without seeming gaudy or excessively ornate. You can proudly keep this teapot on your counter and impress all of your house guests, even if they’re experts in Japanese tea ceremonies. 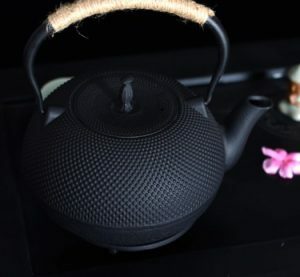 While tetsubins were once used over actual open flames, this cast iron teapot features delicate craftsmanship and a few modern amenities to make caring for the iron easier. This means that you shouldn’t place it directly on the stove. Instead, boil your water in a separate container (I use the microwave, personally, but an electric kettle also works great) and then pour it into the teapot. Add your favorite tea leaves in your favorite tea basket and you’re good to go! The thick metal walls of this teapot do a very good job of absorbing heat from the water. This means that your tea will cool down a little bit at first. Afterward, however, the cast iron will stay hot for a long time, keeping your tea warm. This is an easy, natural way of making sure that your tea is at a drinkable temperature. I mentioned that this teapot has some “modern” amenities. In this case, this means that the teapot has a lacquered interior. This helps prevent rust and reduces the amount of iron that leaches into your tea water (more on this in the next review). You still have to use care when you clean your tetsubin teapot and dry it very thoroughly. The enamel simply means you can make bigger mistakes without causing any problems. I think that this teapot (or other teapots in this general style from Iwachu) represents the best option for most tea enthusiasts. It’s easy to integrate it into your own personal tea rituals due to the enameled interior, and it’s handmade and absolutely beautiful. Plus, it comes with a stainless steel infuser basket that you can use when it’s time to make tea! This teapot is a big step up from the Iwachu cast iron kettle above. Why? For starters, it’s totally handmade to your order. Tokyo Matcha Selection sells incredibly beautiful handmade teapots in a number of styles, not just this one, and they’re all constructed by skilled craftsmen after you actually buy one. This means you get the ultimate bespoke tea kettle experience, not some mass-produced unit. Each tea kettle is carefully created to be both aesthetically pleasing and incredibly functional. I’m a fan of this subtle design with a light engraving on the side, but Tokyo Matcha also sells tetsubins in a variety of other sizes, colors, and designs. If you want a big, tall pot or an ornate golden kettle, you can probably find a handmade Tokyo Matcha product that fits your desires. 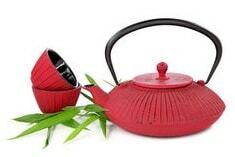 Like other handmade teapots, this also means that the quality control is excellent. A dedicated artisan signed off on each and every detail of your pot before it was shipped to you. This means that you don’t have to worry about chips, cracks, or other defects. I mentioned before that I wanted to talk about iron leaching into your tea. See, these teapots were first used in Japan for that exact reason. When you brew tea in them, a very small amount of metal winds up in the water and makes the tea taste a little bit different. You shouldn’t grind up bits of iron and add them to your food, but iron is a necessary nutrient that you need to survive. Getting just enough of it to taste in your tea cup won’t cause any health issues. Tokyo Matcha Selection’s tea kettles do NOT have enameled interiors. This means that you get the full traditional experience, complete with a slight iron-y taste in your tea. This also means that you have to be extra careful when you clean and care for this teapot. Tokyo Matcha recommends that you actually allow a thin layer of water-scale (called yuaka) to form on the bottom of your teapot. This will improve the taste of your tea and help prevent rust. Unlike many other ornamental tea-kettles, this one is totally fine to use on a stove (or campfire). Heating water takes a little bit of time in cast iron, however, and it can be difficult to control the water temperature precisely. You may still want to use an electric kettle or microwave to heat up your water for tea. of cast iron teapots just to check out how detailed and beautiful these tetsubins can be. The two teapots above are handmade, beautiful, and high quality. They’re also pretty expensive. If you want something that’s a bit more affordable but still stylish, this TOWA Workshop cast iron teapot has you covered. While it’s a bit small, it has a fantastically elegant design that’s both subtle, tasteful, and exquisite. While it’s not produced by hand, this teapot actually has a lot in common with the Tokyo Matcha Selection product above. They share two important features: first, both teapots have a raw cast iron interior with no enamel, and second, both teapots are safe for use in the oven, on the stove, or on a cooktop. This means that you can use your TOWA teapot however you please. Again, I personally think it’s much easier to get your water to the right temperature before you add it to your teapot, but that’s me. Like the other cast iron teapots on this page, you’ll need to be very careful with this product in order to keep it from rusting. TOWA also recommends that you let a layer of ‘tannins’ accumulate along the bottom of the pan to help prevent rust. This is quite similar to what Tokyo Matcha Selection says about their handmade pots. While you’ll have to put in a bit more work to care for these teapots, the unique flavor you get each time you brew tea will be very much worth it. If you want a cheaper, smaller teapot that isn’t quite as high quality (and also not handmade), this TOWA is an excellent choice. It’s a great way to get started in traditional tea brewing without emptying your whole wallet. I mentioned in all of the other reviews that the teapots in question were subdued and exquisite. They’re all perfect for leaving out on the the counter all day to add a touch of class. This tetsubin seperates itself from the pack with its bold, flashy design. 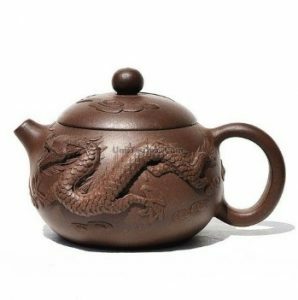 It’s got a dragon engraved on one side and a phoenix engraved on the other, meaning that your tea will be protected by not one but two species of mythical fire-breathing monsters. The construction of this tetsubin is quite similar to the two options above. It’s totally traditional, with no enamel on the inside, giving your tea a distinctive iron taste. It’s also completely safe for use on any stove or oven. This is especially impressive when you consider the detail and depth of the engraving. If you’re looking for a flashier kettle with all of the traditional features of a tetsubin, this bold teapot is definitely a great choice. It’s a great way to celebrate your tea ceremony in a unique, Japanese way. 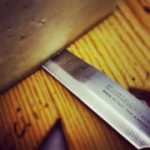 Tetsubins (especially the handmade ones on this page) take a little bit of extra care in the kitchen. If you’re willing to learn about their unique needs, however, you’ll be able to keep your tetsubin around for many, many years. It’s not uncommon for cast iron products like these to be passed down in a single family for several generations. You’re not cooking raw chicken in your teapot. 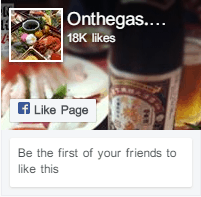 In fact, you’re exposing it to boiling water on a regular basis. Since dish soap and cast iron don’t get along very well, this means you should never use any detergent when cleaning out your cast iron tetsubin. Instead, just use a sponge and some clean water. You NEVER want to soak your tea kettle or leave water in it overnight. Instead, rinse it out and wipe it down each time you use it, then dry it with a towel and let it sit upside down to remove any remaining water. This helps keep rust out of your teapot for as long as possible. You might get a few rust spots in your tea kettle after a few years, especially if you don’t have an enameled interior. Don’t worry too much. Although rust will change the way your tea tastes, drinking water that’s been exposed to a little bit of rust isn’t bad for your health. Some Japanese tea enthusiasts actually prefer the taste of tea that has just the right amount of rust in it. Try it! If you decide that rust isn’t for you, you can always remove a rust spot by applying a mixture of water and vinegar to the affected area and scrubbing hard. You’ll want steel wool, a copper pad, or a salt scrubber. Don’t do this too often: you’re literally removing a layer of your teapot each time. Your nanbu tetsubin will add a bit of fun to making tea, but it won’t do it for you. Here’s how to make the most common types of tea in your new pot. This first step isn’t very precise. All you need to do is get some warm water and let it sit in your teapot for a couple minutes. When your teapot starts to get warm, simply pour it into the sink (or into a potted plant that’s handy). Why do we do this? Cast iron isn’t that good at conducting heat, but it retains heat for a while. This step helps ensure that your tea water doesn’t immediately cool off too much when you pour it into a cold pot. While you’re doing this, it’s a good idea to heat your tea water in a microwave or electric kettle. You can use a stove-safe cast-iron tea kettle, of course, but I think it’s much easier to use a modern appliance. You want to shoot for about 175 F for both green and white tea. 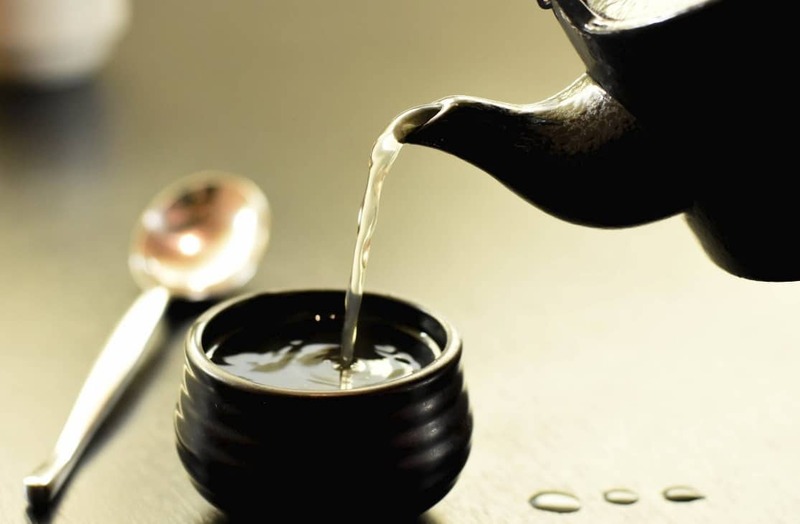 Oolong and more delicate black teas work best with 195 F water, while more robust black teas can go as high as 205 F.
This is because of how tannins work. Tannins are bitter compounds that live in many foods and drinks, including tea, coffee, and wine. They’re trapped inside the tea leaves until you begin to steep your tea. When you steep your tea, flavor compounds are extracted into the hot water. Tannins are extracted as well, however, and the hotter your water is, the more tannins are released. As a result, tea drinkers try to use the coldest temperature of water that will still get all of the flavor compounds out of the tea. This makes the final product much less bitter. Different people like tea different ways. If you think that you like your green tea steeped in actually boiling water or your black tea steeped in lukewarm water, that’s fine too! The above information is a great starting place. Feel free to experiment and do things your own way. 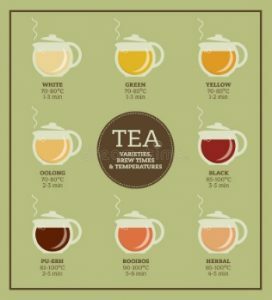 Just like with water temperatures, steeping times are very much up to your personal preference. Longer steep times give you stronger tea that’s also more bitter. When you’re done steeping your tea, be sure to save the leaves. Teabags generally don’t do re-steeping very well, but actual tea leaves and buds will make tea that’s just as good the second time around. Many serious tea drinkers think that oolong is even better on the second steep! A traditional Japanese cast iron teapot is a thing of beauty. These carefully crafted containers are a lot of fun to make tea in and can be passed down in a family for generations. If you want to spice up your home tea drinking, consider getting one of these wonderful pots. You’ll enjoy the aesthetics, the unique functionality, and the incredible tea that you make in your Japanese tetsubin teapot.